Dr Andy Palmer (left) with Al Tareq Al Ameri. On the eve of the final race of the FIA Formula One Etihad Airways Abu Dhabi Grand Prix, Aston Martin Lagonda announced a partnership with Yas Marina Circuit that will see the venue become the official ‘home’ of the British marque in the Middle East. 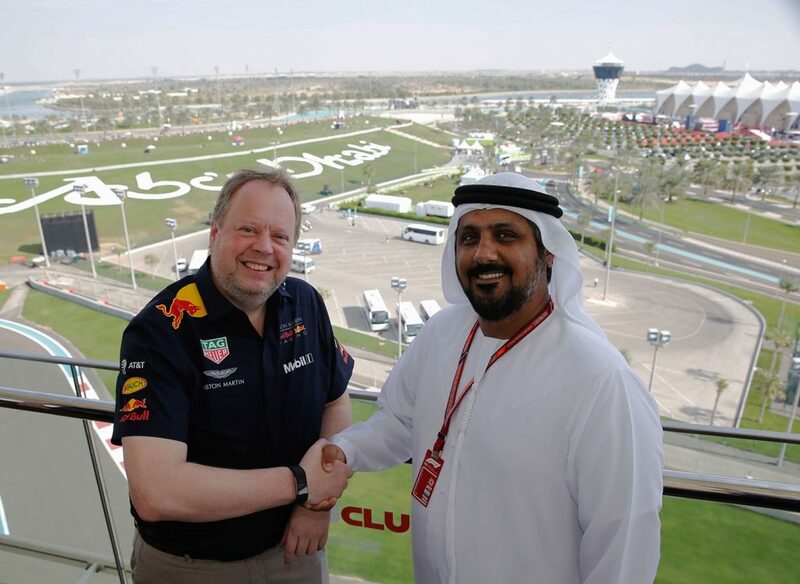 The partnership was formalised by Dr Andy Palmer, Aston Martin Lagonda President and Group Chief Executive Officer, and Al Tareq Al Ameri, Yas Marina Circuit Chief Executive Officer, prior to qualifying for the Grand Prix. The newly established Middle East, North Africa and Turkey (MENAT) team, headed by regional president Dan Balmer, will be based at Yas Marina Circuit owner Abu Dhabi Motorsports Management’s headquarters. “We are really excited to be bringing our vision for the region to life, and moreover supporting the company’s global vision for solidifying the structured growth of our involvement in motorsport,” said Dan Balmer. Aston Martin said its 105-year history is steeped in competitive motorsport and this latest partnership with one of the most iconic F1 circuits in the world reinforces that commitment. The brand currently competes at the top level of motorsport with Aston Martin Red Bull racing in Formula One and Aston Martin Racing in the World Endurance Championship (FIA WEC). “We are extremely proud to be opening our doors to Aston Martin and very much look forward to a long and fruitful partnership,” said Al Tareq Al Ameri.